Halibut are the big bad flatfish of the ocean and we have plenty of them within close proximity of Ketchikan! We can usually get into good halibut fishing within 15-25 miles of town so a 1 hour run out to the fishing grounds is standard protocol. We will often fish between 150 feet on the shallow side and about 300 feet on the deeper side and we are looking for flat shelves and sandy bottoms where Halibut like to hang out. 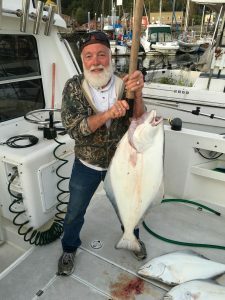 Our average halibut in Ketchikan is probably in the 10-20 pound “chicken” range but it is not uncommon to catch a 30-60 pounder that puts up a great fight and each summer we get a few of the real monsters (100 plus pounds)! Halibut are a bottom-dwelling flatfish, so the fight is generally all up and down. There is a common misnomer that halibut don’t fight and that they are just dead weight, this is absolutely false! We fish with light enough tackle and in shallow enough water that you feel every head-shake and most of the halibut we catch will give you several good runs back to the bottom before the fight is over. Most people we take out for these “flatties” will be tired and ready to move on to the next kind of fishing after catching just a couple of our awesome halibut. As a general rule, once you hook into a halibut and get it off the bottom and headed up towards your boat, as long as you keep the momentum up by reeling the fish will come up to the surface. When you slow down and allow that fish to turn its head back towards bottom, HOLD ON because even a small fish (15-25 pounds) will run straight back to the bottom screaming out line as it goes! We usually start halibut fishing in earnest toward the Beginning of June and by the 1st of July we expect the halibut fishing to be wide open. The good fishing will continue for all of July, August and into September until the weather no longer allows us to get out to where the Halibut live. 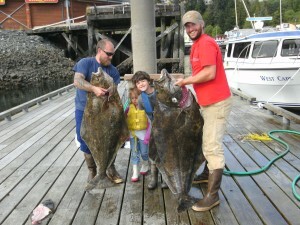 We have done really well halibut fishing as early as the first week of May and as late as the first part of October, but generally speaking June, July and August are your best months to halibut fish in Ketchikan. The State of Alaska Department of Fish and Game website has loads of good information on all of our sport-fish including Halibut, check it out if you want more information. 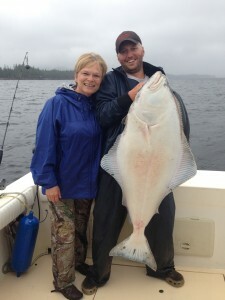 If you want to talk about Halibut fishing or book a trip, contact us now!